With 2K Marin busy on the new XCom, publisher Take-Two could hand the BioShock license off to another one of its studios. 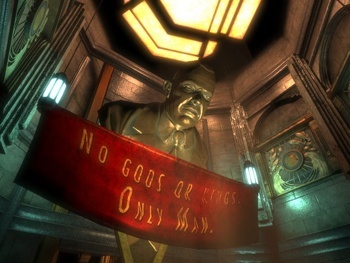 The original BioShock was developed by Irrational Games - then known as 2K Boston. BioShock 2 was developed by 2K Marin (in cooperation with 2K Australia). And a hypothetical third installment in the series could be developed by ... okay, that one isn't quite so clear. According to Take-Two big boss Strauss Zelnick, however, the possibility that the franchise could switch studios a third time remains very real. The news broke during Take-Two's 2010 second quarter financial call, when an analyst asked if 2K Marin's work on XCom would prevent it from returning to Rapture. "We think BioShock is still one of the most important franchises in the industry," answered Zelnick. "We do intend to support it; doesn't necessarily have to be at 2K Marin, but we do intend to support the franchise." This doesn't necessarily imply that we'll be getting BioShock 3 anytime soon - Zelnick noted that Take-Two intended to continue supporting BioShock 2 with DLC above all else - but it's an interesting thought, isn't it? Take-Two doesn't have quite as wide an umbrella of studios as rivals Activision or EA, but there are certainly more than a few noteworthy developers beneath its branches, namely the Rockstar studios and Civilization developer Firaxis. I'm not exactly sure how you'd do an open-world Grand Theft Rapture or Sid Meier's BioCiv, but it'd be kind of cool, wouldn't it?